Comet Kart sales has announced that they would be sponsoring the Senior Yamaha Can class through the season. “In the mid-1950’s Emerson “Diz” Dismore joined in a new American hobby, go karting. A long time drag racer and car fanatic, Diz made karts from scratch and added engines from old lawn equipment. Working full-time at Western Electric and enjoying his new hobby on the side Diz started to become more serious about the emerging sport. Over time he began to devote more and more time to his karts and friends started to ask for his expertise on karting. In 1959 Diz opened up a part-time kart shop in his garage that was a dealer for “Comet” karts as well as parts and off road vehicles. Even though the original “Comet” kart company went out of business, Comet Kart Sales owned by Emerson Dismore continued on strong, to the point that Diz quit his job at Western Electric and worked at Comet Kart Sales full time with his wife Retha. Diz’s young son Mark began to race for his father and became an integral part of Comet Kart Sales. Winning many prestigious kart races and awards as well as building championship winning kart engines before moving on to cars and eventually running fulltime in Indycar and racing in the Indianapolis 500. Mark also won the prestigious 24 Hours of Daytona racing for the legendary Dan Gurney. The kart shop was so successful that Diz built a new building to house the kart shop. Comet Kart Sales was also a large Honda dealer through the 1970’s and 80’s before selling out that end of the business in the late 80’s. In 1976 the building caught fire and burned to the ground. Despite having to start over and sort through what was left; Diz, Retha, Mark and their friends and employees were not going to let Comet end there. They spent a year cleaning parts, restocking the inventory and building a new building. In 1977 a new 20,000 sq ft building was complete and is still the same building that Comet Kart Sales is in today. Today Mark and his wife Donna run the kart shop day to day, Diz passed away after a three year battle with cancer on October 28th 2003. Retha has since retired from Comet Kart Sales and is enjoying her retirement. 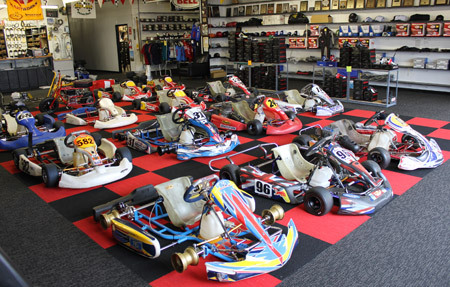 With over 50 years in the karting industry, Comet is still going strong and is looking to the future, adding an online parts store to compliment the brick and mortar store, cometkartsales.com in 1999 and in 2004 opening a racing kart facility in the Indianapolis area, New Castle Motorsports Park. Comet is also continually adding new parts and products to their product line and online store. Comet also attends dozens of national karting events every year, continuing the tradition of race winning Comet Racing Engines with strong on track performance and excellent customer support! Please visit our partners websites and use them for all your karting needs.